KIC 8462852 is a mysterious F type main sequence star around 1,280 light years away, and has many names, including Tabby’s Star, Boyajian’s Star and the WTF Star (the WTF stands for What is the Flux?). The star is of interest to scientists because of a long-term dimming trend, as well as local dimming events. The star’s brightness dips suddenly, and cannot be explained by any conventional understanding of planetary formation or stellar evolution. In May this year, the star experienced another dimming event, and astronomers around the world co-ordinated to observe the star, diverting astronomical instruments away from previous planned and scheduled campaigns at the last minute. According to firstpost.com, There are multiple explanations about what could cause the dimming events, including the star swallowing up a rogue planet, a debris field of colliding planets and a cloud of disintegrating comets. Once of the most interesting theories is that there is a Dyson sphere around the star, an alien megastructure that circles the entire star and harvests a significant portion of its energy output. A new study conducted using data from NASA’s Spitzer and Swift missions, as well as the AstroLAB IRIS observatory provides fresh evidence that there is no alien megastructure around the star, and that the dimming is caused by an uneven ring of dust. The significant indicator of this is that the dimming is less in the infrared portion of the electromagnetic spectrum as compared to the ultraviolet portion. If there was an alien megastructure, the dimming would be more or less uniform across the spectrum. 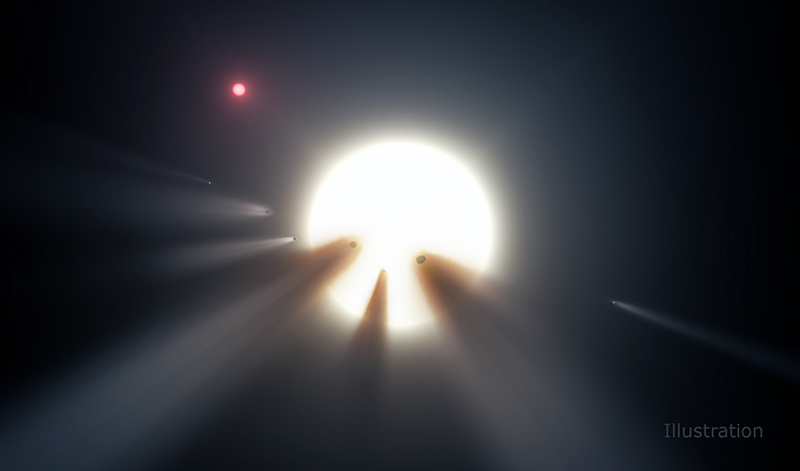 A swarm of comets around Tabby’s Star. Image: NASA. The study indicates that the dimming is caused by particles of dust, but does not specify the origin of the dust, which could be planetary impact events, a swarm of comets or the remains of billions of years of planetary formation. The study only explains the long term dimming, and not the sudden short term dimming events. The brightness of Boyajian’s Star dips by up to 20 percent during these dimming events, and that aspect of the mystery has not been unraveled yet. A possible explanation is that the star has a solar activity cycle. The star remains an object of interest for future studies and observations.